The Decemberists have a total of 6 proper records out now. They are an extremely good band and are very arty. It is a shame for such an arty band to have below average album covers as I believe they do. I’m not crazy about any of them. Castaways & Cutouts (my least favorite album by them) seems to have the best artwork with the souls escaping the ship. The King Is Dead is good but boring. The Hazards of Love is clever but no eye-catching. 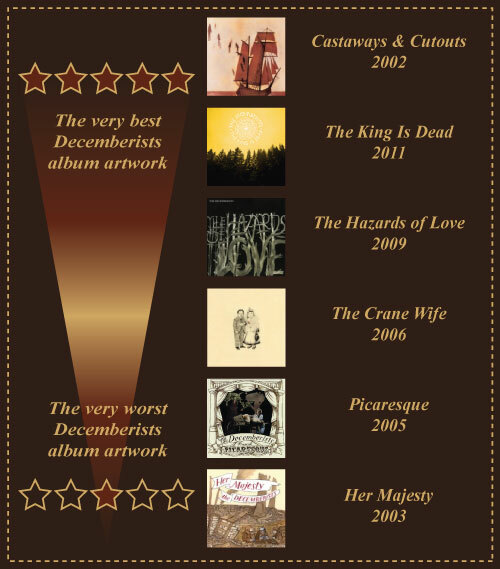 This entry was posted in Career In Album Artwork and tagged album cover, artwork, career in album artwork, Castaways & Cutouts, Colin Meloy, Her Majesty, Picaresque, The Crane Wife, The Decemberists, The Hazards of Love, The King Is Dead. Bookmark the permalink.